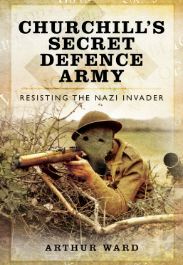 Thanks to Pen & Sword Military Books we have five copies of Arthur Ward’s ‘Churchill’s Secret Defence Army – Resisting the Nazi Invader’ book to give away. This is an update of Arthur’s 1997 book ‘Resisting the Nazi Invader’. This version has lots of new photography, a new introduction featuring interviews with CART Founder Tom Sykes, Aux writer John Warwicker, and a significantly amended chapter that includes transcripts from interviews with Auxilier Bob Millard. Winners will be drawn on Friday 1st March 2013. My Grandfather worked with Tommy Flowers on the machines for Bletchley Park – I’d love to read this book for more background on all those Hidden Heroes of WWII.